Exhibition of Sebastian Helms, Denis Luce and Inga Martel as a part of ”lindenow"
Accordion and guitar tunes of two musicians from Berlin. performance art and videos by Sam Amidon. An intervention for new years season. A remote exhibition of Denis Luce and Johanne H. Ritter. shared exhibition of both artists. Experimental crossover guitar soundscapes by Hannes Buder. photography, audio and video work by the photographer Betty Papst. An exhibition of some first diplomas from the media art class on the Academy of Visual Arts, Leipzig. Quadrolux describes the space - sound - performance by Marcus Horndt and Nora Thiele. 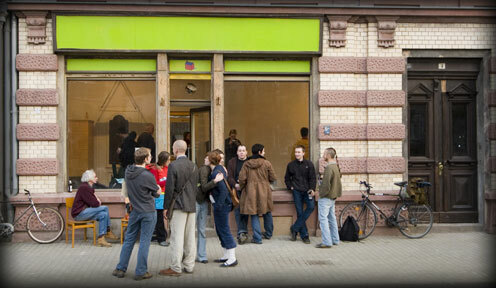 A group exhibition with different art students from Hannover, Weimar and Leipzig. Denis Luce and Inga Martel. A music happening by Friedrich Kettlitz, Alexander Schubert and Olliver Schwerdt. Painting, illustration and graphics shown by Kristin Nöthling, Johanne Ritter and Jens Schubert. The place has been opened on december 9th in 2005 with three different installations.